We kindly ask all exhibitors going to WORLD CAT SHOW to take with you proof of bank transfers for cats, please. This is important because of the good and quick cats receptions on Saturday morning. Many of transfers is unclear, with insufficient basic information such as name, surname of exhibitor or name of the exhibitor's cat. Note! October 30, 2011 will be a change from summer to winter time, so during the night from Saturday to Sunday we switch watches from 3:00 to 2:00 in the morning. We will sleep an hour longer. 2 exhibitors can enter on every one reported cat, they must have a confirmation of entry, the other person will pay for a ticket (also at the entrance to the exhibition area by car). Parking for exhibitors is free. Exhibitors with "camper" cars will be able to enter the premises of the exhibition but will not be able to stay there overnight. Parking for cars similar to "camper" is located at Matejko 63, near the shop "Biedronka", booking recommended. We provide chairs for exhibitors. 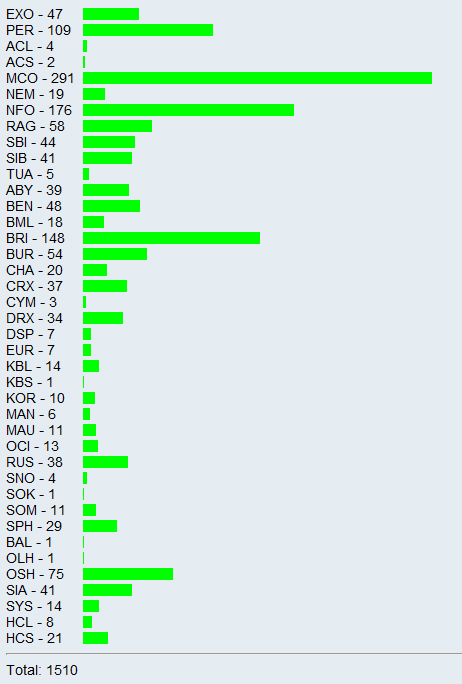 Here you can see the statisitcs of cats' entries for the World Show. "All cats must have a valid health certificate no older than 3 days before the show "
Note to all exhibitors and foreign breeders who pays for WWS in euros! Please note the way to make bank transfers. There are 3 ways to pay the costs of transfer and the right is 'OUR', it means the total costs of the transfer. In this way, the person making the payment can be sure that the full amount will be reached by the organizer of WWS. These people who have not paid the total cost of transfer will have a possibility to do it on Saturday morning before WWS. WORLD CAT SHOW POZNAŃ 2011 has obtained another media patron - ANIMAL PLANET TV, the one and only television in the world dedicated entirely to the life of animals. This channel has a nationwide scope and it is available on all cable networks and satellite platforms in Poland. In cooperation aired on ANIMAL PLANET will be able to see polish celebrities from the world of art and culture with their feline darlings. The participation in this program has been confirmed, among others, by the great cats lovers: TVP journalist and presenter Agnieszka Szulim, juror of the TVN program “Dancing with the Stars” Piotr Galiński, and actress Olga Bończyk. In addition, this project will be supported by actions on the fan page of DISCOVERY CHANEL on Facebook. The campaign is to promote appropriate, social attitudes associated with caring for animals. An Internet TV FAUNA PLANET TV has also decided to become the media partner of WORLD CAT SHOW POZNAŃ 2011. Television is addressed to all the pets lovers. The main goal is to educate society how to care of animals and their needs. The advertisements and information connected WORLD CAT SHOW 2011 POZNAŃ 2011 will be able to find in the GŁOS WIELKOPOLSKI, the oldest newspaper in Poznań, and one of the most popular daily newspapers in Wielkopolska, with a newspaper circulation over 62 000 copies. The most relevant information about WORLD SHOW CATS POZNAŃ 2011 will be available in October in this title. We are very pleased to announce, that the patronage of the WORLD CAT SHOW POZNAN 2011 has been taken over by the PRESIDENT of Poznan and THE CITY COUNSIL . We belive it to be the biggest event ever for all animal lovers. MERCURY RADIO has joined the group of media sponsors of WORLD SHOW CATS POZNAŃ 2011. The radio station will be inviting their listeners to that unusual show in their news and through the website. There will be also held on-air for contests with WORLD SHOW CATS prizes for listeners. TVP POZNAŃ has joined the group of media sponsors of WORLD CAT SHOW 2011 POZNAŃ 2011. This is one of the most active regional branches of the Polish Television SA. TVP POZNAŃ is available throughout the Wielkopolska, the region of Poland. Is usually viewed by nearly 3.4 million people. In collaboration with WORLD CAT SHOW 2011 TVP POZNAŃ will be inviting to the show in it’s news "Telescope" and also "Studio Poznan", as well as through their website www.tvp.pl/poznan. RYNEK ZOOLOGICZNY - the nationwide magazine of zoological industry, has joined the group of media partners of WORLD CAT SHOW 2011 POLAND. This year's edition will not only be the largest presentation of feline beauty in the history, but also it will be the largest zoological brand trade, that has ever taken place in Poland. Accordingly, the readers of RYNEK ZOOLOGICZNY will certainly be interested in this unique event. A monthly magazine for all cat lovers “KOCIE SPRAWY” has become our media partner of WORLD CAT SHOW 2011 POLAND. Here, you can find latest information about our event. The first news can be found already in the May issue of the magazine. On-line entry form is ready. New languages will come soon. You can find info about show cages in rules and conditions. We are very pleased to announce, that the patronage of the World Cat Show Poznań 2011 has been taken over by the PRESIDENT of Poznan and THE CITY COUNSIL. We believe it to be the biggest event ever for all animal lovers. Official website of the World Cat Show 2011 is finally open. Subscribe to our RSS Feed to be informed of the latest news and updates about the event. We have the honour to invite you to 21st FIFe World Cat Show. The show will take place at Poznań International Fair in Poland. There’s only a few days left! Learn more about the show. The first official information about the show was published.